This configuration option is used for mapping UOM fields for Length (Length and Width), Pack (Free form text), Sales (Free-form text) and Weight. Length and Width (OLGT) is used for mapping length codes defined in Length and Width, which are set up in SAP Business One by navigating to Administration > Setup > Inventory > Length and Width. 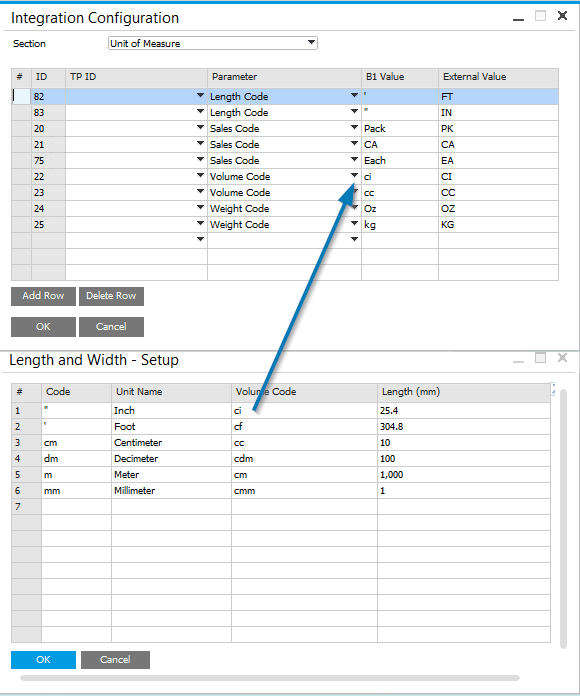 When configuring a Length or Width, the Code must be defined as shown in this example. 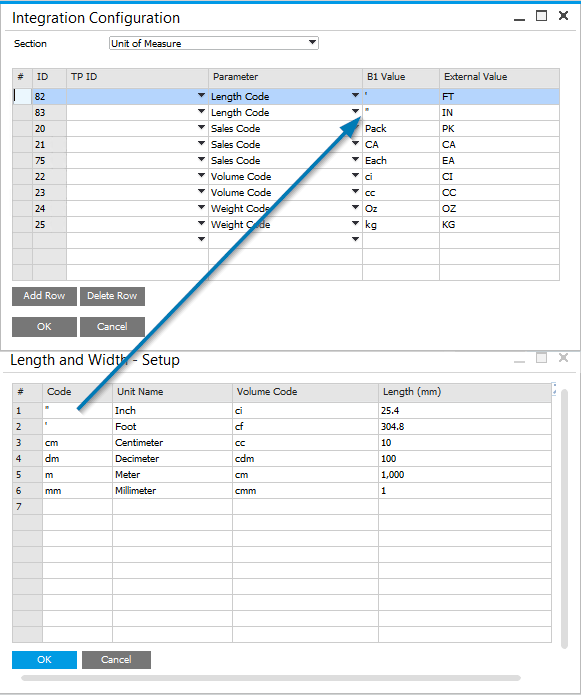 Volume (OLGT) is used for mapping volume codes defined in Length and Width, which are set up in SAP Business One by navigating to Administration > Setup > Inventory > Length and Width. When configuring Volume, the Volume Code must be defined as shown in this example. Pack (UOM Free form text) is used for mapping free-form Packaging UOM defined in Item Master Data, which is set up in SAP Business One by navigating to Inventory > Item Master Data. The Packaging UoM Name must be defined as shown in this example. Sales (UOM Free form text) is used for mapping free-form Sales UOM defined in Item Master Data, which is set up in SAP Business One by navigating to Inventory > Item Master Data. The Sales UoM Name must be defined as shown in this example. Weight (OWGT) is used for mapping sales unit weight codes defined in SAP Business One Weight configuration to the SPS Qualifiers for Weight. SAP Business One Weights are configured by navigating to Administration > Setup > Inventory > Weight. Weight codes must be defined, as shown in this example.